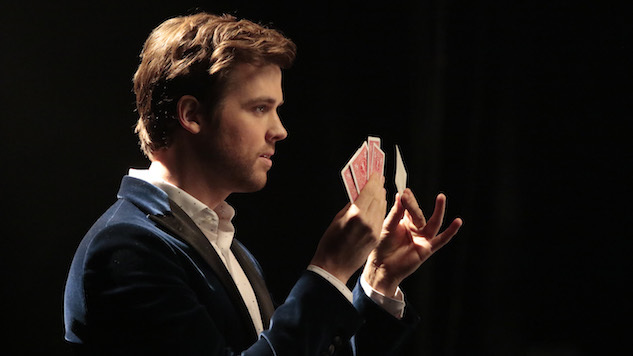 This questionably charming television magician, simultaneously too polished and too scruffy to be believed as the master illusionist he claims to be, is Cameron Black (Jack Cutmore-Scott), and he, along with his ragtag band of misfit, expert illusionist techies, is the FBI’s newest Quirky Consultant™. Now, you want to say that this is a painfully blatant example of the kind of screwball procedural premise only Hollywood could gin up. A magician! Consulting for the FBI! But then you read a profile of master pickpocket illusionist, Apollo Robbins (who, not incidentally, consulted on TNT’s Leverage), and get to the part where he teams up as a consultant first with a Vegas detective, then with a CIA interrogator, then with the DOD, and you’re like, yeah, okay, MAYBE—a magician! Consulting for the FBI!. It definitely makes more sense than a psychic, or a bored crime novelist, or actor Ryan Hansen. So, sure! Deception, Cameron Black, FBI, why not? Okay. Here it is then. The moment you decide whether or not you care about magic enough to let yourself be spoiled as to how Cameron Black managed to pull off that Vegas-to-Times-Square illusion from the trailer. Or however much you don’t care. Whichever your preferred operating principle vis-a-vis the sanctity of the tricks behind magic is, Deception, and now Paste, is here to whip back the curtain. Cameron Black is twins, a fact that no one but his brother, Jonathan (also Jack Cutmore-Scott), their traveling magician dad (dead), and Cameron’s current Whiz Mob have known for the twins’ entire lives. It is a very dark concept, Jonathan literally never having had his own life—even their childhood act with their dad relied on no one knowing Jonathan existed—and it is only made darker still after some mysterious heterochromatic femme fatale criminal illusionist nemesis of theirs (Stephanie Corneliussen) sets Jonathan-as-Cameron up for murder, which lands him, on his first night as his own person, in prison… which is what prompts Cameron to magic his way into FBI consultancy in the first place. But this is a Quirky Consultant™ procedural, so all of that darkness plays more as a rumbling dimness underneath Cameron’s labradoodle sleights of hand at FBI Agent Kay Daniels’ (Ilfenesh Hadera) side, and is anyway all secondary to the fact that Deception, as what one would think was just the next in a line of dime-a-dozen procedurals, has figured out a way to make the dual role casting trick / Playing Their Own Twin trope a signifier of both effect and method. That is, casting Cutmore-Scott in both fictional illusionist roles? Kind of… genius. Let me explain. If the best part of stage magic is how it plays live, in person, when the mark knows there’s sleight of hand going on but still feels like it’s all real—and from that Apollo Robbins profile linked above, it really seems like it is—then television would seem to promise nothing but diminishment. Like, we know that everything in Hollywood is fake! So what, Cameron Black can levitate a spinning card between his hands on screen? Over on the screen of Deception’s network-neighbor, Agents of S.H.I.E.L.D., Daisy Johnson is cracking whole planets apart with her Inhuman earthquake powers. Masters of their craft like Robbins may use cinematographic theory as a tool (“I use framing the way a movie director or a cinematographer would,” he says in Green’s profile), but televisation itself blunts the whiz-bang power of an illusionist’s live, interpersonal skills. However, by making Cameron Black’s secret power be his even more secret twin brother, also played by Cutmore-Scott, Deception has brought to the table the kind of sleight of hand that can ONLY happen on television. Cameron-and-secretly-Jonathan Black, real magician(s), could never happen in the real world; not even Robbins is that good. Cameron-and-secretly-Jonathan Black, TV magician(s)? Well, that’s a pretty good twist on the old, variably successful Hollywood tradition of stunt casting one actor for two roles (putting the same actor on screen, acting across from themselves, is one of the oldest pieces of Hollywood magic there is). This twist is made especially good when the actor stunt-cast in the role is so anodynely charismatic, so utterly unremarkable in his “eh, sure” thirtysomething, handsome-scruffy-white-man inconspicuousness as is the perfectly OK Cutmore-Black, that he/they could only come from a casting director with an illusionist’s sense of human psychology. Put it this way: The Mentalist’s Simon Baker, AKA charm personified, could not play his own secret magician twin, nor could USA’s Largest Adult Son forebear to Simon Baker, Psych’s human cartoon, James Roday. Castle’s booming diva, Nathan Fillion, could not play his own secret magician twin. Ryan Hansen, capital-A Actor, definitely could not play his own secret magician twin. Jack Cutmore-Scott? As the memes say, “Never heard of her.” He can, unremarkably but very believably, play his own secret magician twin. Since the success of Cutmore-Scott’s dual role casting hinges on the effect-to-method question, Deception understanding its own premise thoroughly enough to use the trope as a tool rather than a stunt, I set similar parameters for this list, worrying less about the strictness of the twin relationship than about the contextual effectiveness of the show’s use of the same actor in multiple roles. That means that in addition to identical twins, this list includes identical cousins, clones, and even one actor playing two not-twinned brothers. Of all the Friends characters to get a surprise identical twin, Lisa Kudrow’s famously eccentric Phoebe Buffay seems like an odd choice. How much more comedically rich might it have been to pull a suaver brother to Joey, or a hippie sister to Rachel, or a chill, supportive brother to Ross out of the writers’ room woodwork, than to give the audience an only slightly odder, definitely meaner long-lost sister to Phoebe? But ultimately, Phoebe’s oddness—and Kudrow’s talent channeling it—makes Ursula’s existence both worthwhile and tragically illuminating. Phoebe is lovable not because she is so weird that she’s the comedic relief, Ursula shows us, but because she came out of the same crappy childhood Ursula did as Phoebe, who may be odd, but is full of all the love and compassion Ursula seems content to have left behind her. Ewan McGregor’s Emmit and Ray Stussy are the first pair on this list to not be twins—they are, as the featurette above explains, only brothers. But that genetic and emotional distance, contrasted with the fact that the audience knows not just from the credits but from McGregor’s ineluctable notoriety that both are being played by the same actor, introduces a kind of hyper-awareness from season start to finish that series creator Noah Hawley seems to have been aiming for specifically. Whether Fargo’s Season Three experiment worked for you or not, in this case, a less recognizable actor would not have been as effective at doubling himself on screen. Sure this dual role only lasted one episode, but when the insane (but telegraphed!) “Who’s A.D.?” twist finally landed in the Pretty Little Liars series finale and we learned that the person torturing the Liars for the last two years was Spencer’s secret British twin, the psychotic Alex Drake, all of us deep in Rosewood’s single block of incestually mysterious weeds literally screamed. To quote my PLL co-recapper/#Twincer-truther, Rosemary: “TWINCER IS REAL. SHE’S REAL AND SHE’S BRITISH. And not just any British. We’re talking My Fair Lady/Sarah Manning, lots-of-coal-makin’-lots-of-’eat, Cockney British!” And not like they were ever going to try and cast a Troian Bellisario lookalike for the role, but since the whole premise of the twist was that Alex Drake had gone so Single White (Twin) Female nuts that her goal was to keep Spencer hidden in an underground bunker for the rest of her life while she, Alex, slipped into Spencer’s real life above ground—like, to the point that she had her/Spencer’s ex-boyfriend shoot her in the shoulder so that she would look just like Spencer, obviously the only casting decision here was Troian x 2. Alex’s Cockney accent, though… that was all Troian. The Vampire Diaries wasn’t the only teen show to take on the “Playing Their Own Twin” Trope in the last decade (Freeform had Alexandra Chando’s The Lying Game), nor was it the only one on The CW (which had, briefly, Sarah Michelle Gellar’s Ringer), nor, even, was it the only teen show on the CW/WB to feature a good twin/evil vampire twin pairing (hey, Buffy the Vampire Slayer’s Alyson Hannigan in “Doppelgangland”!). It was, however, the best show doing all three, thanks to Nina Dobrev’s delicious turn as Elena’s evil 15th-century doppelgänger/vampire, Katherine Pierce (née Katerina Petrova). Much of The Vampire Diaries was about identity, and the nature of the human soul, and having Dobrev take on the two most extreme opposites of how one soul could turn out breathed extra life into that question. Plus, Katherine—like Paul Wesley’s ancient and carelessly powerful doppelgänger, Silas, who showed up as one season’s villain long after Katherine had staked her malevolent claim—was just plain fun. A story about clones necessitates a single actor playing many parts; that is a given. But just because the actress in Orphan Black’s lead roles was so phenomenal (see below), that didn’t mean that the next set of clones would be so lucky. And to an extent, the Castor line of clones paled next to the Ledas. But as men raised by the military not only to be self-aware, but to think of themselves as brothers, Ari Millen’s Castor clones are never able to go as far afield, personality-wise, as Tatiana Maslany’s Leda clones are, so phenomenal might be too high a bar to strive for. Nevertheless, Millen’s performances of each Castor clone we meet are differentiated with a subtlety that, when the differences unmasked are psychotic tendencies (Seth), underscore just how close any of us might be from a ragged edge. Jane the Virgin is so incredibly chockablock with so very many twists and turns that it is almost easy to forget that the center line of one major avenue of those twists and turns for the past couple seasons has been the inimitable Yael Grobglas in the dual role of Petra and her surprise, poorly socialized Czech twin, Anezka, who first surfaced as part of a long con to take over Petra’s life à la Alex Drake and has since become the possible key to Petra’s downfall. Grobglas has always been magnetic in her performance as the steely, blunt, insecure Petra, and adding the simpering, easily bullied, even more insecure Anezka to her plate has only increased that magnetism. Bridging the divide between drama and comedy—all the way into the reality of Grobglas’ Instagram!—the Petra/Anezka pairing is one for the television ages. Zach Galifianakis has been doing interviews and bits as his (fictional) twin brother, Seth, since 2006, so the fact that he has cast himself as the very dissimilar twin brothers Chip and Dale Baskets in his arthouse tragicomedy, Baskets, is almost not like casting the same actor in two parts at all, but rather like going the more traditional route and casting real twins. This trippy mental identity gymnastics, so far from what most comedies would ask of its audience, is exactly what Baskets is going for—a fact driven home by the casting of Louie Anderson as Mrs. Baskets not as a stunt, but in compelling earnest, and by casting real-life twins Garry and Jason Clemmons as Chip and Dale’s adopted brothers, who get along and always appear together, but only in family photos or across a digital distance on Skype. One of Disney’s newest cross-network wunderkinds (she’s currently guesting on Agents of S.H.I.E.L.D. as a sociopathic teen HYDRA assassin), Dove Cameron first popped onto America’s screens as chill basketball star Maddie and her glam, actress twin, Liv, finally returning home to Wisconsin after years starring on a fictional version of Glee, Sing it Loud!, whose title is only ever reported in wailing song. While Liv and Maddie are played by the same actress, their sitcom misadventures come much closer to real twins Tia and Tamera Mowry’s from Sister, Sister, the fact that they are played by the same actress feeling more like stunt casting to get eyeballs than any of the others so far on this list. But Dove Cameron is so exceptionally talented at playing up the differences between Liv and Maddie without going overboard and with keeping their emotional bond in mind (and the show’s theme song is so dang cheerful and catchy) that it is impossible not to rank her this high. This is stretching the definition of “twins” a bit, as Patty and Cathy Lane are technically identical cousins, not identical sisters, but… that joke is kind of the point! Several films, including Hayley Mills’ The Parent Trap (1961), came first in terms of pioneering the movie magic needed to smoothly translate a dual role to a single screen, but The Patty Duke show was the project that set the sitcom standard, especially in giving funny girls and women a whole new field in which to stretch their comedic muscles. Its legacy has reverberated through television history, first with Elizabeth Montgomery playing Samantha’s identical cousin, the raven-haired Serena, on Bewitched, then with Dove Cameron on Liv & Maddie, then with Yael Grobglas on Jane the Virgin, and later with Patty Duke herself guest starring on Liv & Maddie as that show’s twins’ twinned grandma. Of course little can match the energy of a candy-colored sitcom in the full flush of Disney’s contemporary exuberance, but where The Patty Duke Show lacks pizzazz, it makes up for it in historic might: All the great twin girls of comedy trace their way back to Patty Duke’s classic goofball Sixties shenanigans. Obviously, the Platonic exemplar of playing your own twin is Orphan Black’s exceptional Tatiana Maslany, who plays not only her own twin, Helena, but a full dozen other iterations of the Leda clones’ genomic template, and Kathryn Alexandre, the body double actress whose face is never on camera, but who Maslany never forgets to credit as her equal in every aspect of performance. The technological feats of camerawork on Orphan Black are just as impressive, the creative team not just fitting twins of the same actor in the same scene, but all kinds of configurations, with character counts upwards of half a dozen. One of the best behind the scenes videos of any show in recent memory, in fact, is the “Making of the 4 Clone Dance Party” from Season Two (see above), which puts the magic of Cameron Black’s best tricks to shame. In the end, Apollo Robbins is right: Seeing how the trick is done isn’t the thing. From the clones’ dance party to McGregor’s makeup tests to, yes, Cameron Black’s Big Twin Reveal—the audience knowing the mechanics of any kind of trick matters less than the skill of the illusionist performing them. We may keep watching Cameron Black pull bullets out of thin air, but he’ll be watching out for how to trick us next all the same. Deception airs Sundays at 10 p.m. on ABC.